"Being a Yorkshire lass, I take great pride in making these puddings the bigger the better! The only drawback is not having a big enough plate for them!" Place a muffin tin in the preheated oven. Whisk eggs, milk, salt, and pepper together in a bowl. Gradually whisk 1 cup plus 2 tablespoons flour, a small amount at a time, into egg mixture until batter is smooth. Let rest 10 to 15 minutes. Carefully remove muffin tin from oven and add lard to 6 muffin cups, about 1 teaspoon per muffin cup. Return to the oven. Whisk batter again until small bubbles form on the surface. 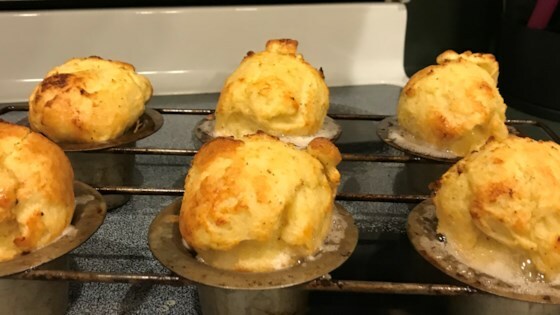 Carefully remove muffin tin from oven and ladle batter into greased muffin cups, filling almost to the top. Bake in the preheated oven until puddings are risen and golden brown, about 20 minutes. Make these fluffy muffins, an English side dish that’s not a pudding at all. Vegetable fat can be used in place of the lard, if desired. Ensure there is sufficient room between racks inside the oven to allow the puddings to rise. I have 2 racks in my oven, so I tend to remove 1. Great recipe! I used bacon grease instead of lard. Baked for 24 minutes.